I've put up a page on good books I've either read or heard about. I'll be updating that page frequently, so keep checking back. I got a waffle maker for Christmas, so I tested it out today. It's not a very big deal or difficult to make or anything, but since I rarely cook, I decided to post my pictures from this morning. 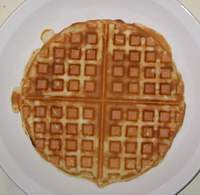 On the right is a picture of a finished waffle, but click here if you want to see more. I've added my entries from October to December to the archives. I finally finished my scarf! I have pictures up here. 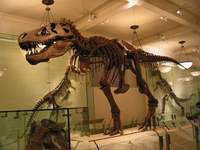 Today I went to the American Museum of Natural History with my father. We saw a new exhibit on The First Europeans: Atapuerca which was really cool. Also we visited the dinosaur bones. I was kinda disapointed that the hall of Ocean Life was closed because it's always been my favorite. Wow! Sixteen inches of snow fell yesterday! I really want to make this cuff bracelet. I just finished a pink with white polka-dots ribbon belt. I have some additional pictures and directions here. (scroll down a bit) Out of all the belts I've made so far, I think this one is my favorite just because I really like the ribbon. I'm going to have some free time this week, so hopefully I'll be making some other stuff. Wow, I can't believe I haven't updated my site since mid-January. I've been so busy lately with school work that I don't have much time for fun stuff. This weekend I should probably have something somewhat interesting to post, but till then...not much. I've ventured a little into cooking, actually, its more like the cheaters way of cooking. I made chocolate chip cookies! However, not from scratch, from those little ready made Tollhouse things. I guess that doesn't really count as cooking then, although I have made cookies many a time from scratch, just not in this millenium. I've finally taken pictures of some of the ribbon belts I made for myself. I made about five or six more for gifts last year, but I don't have pictures for them. These belts were made last year and were the first I ever made. 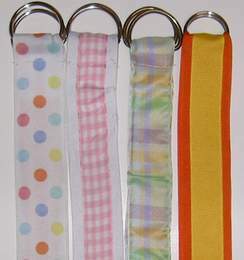 (which is obvious if you look closely at them) On my ribbon belts page I'll put directions on how to make each type of belt. Update on scarf: It's about three feet long now, and progressing very slowly. I think I'm going to make it twice as long, which will probably take forever and might be done by next year. I've put up slightly coherent directions on how to make a ribbon belt. There aren't any detailed pictures yet, but I'll post some soon. I'm studying for midterms so I don't have very much spare time to do any fun stuff, so no interesting updates! I work a little bit on my scarf each night, but thats about it. I went to the library today and got out a bunch of books on web designing, XML, Dreamweaver, and Photoshop 7. Hopefully one of them will be helpful so I can make better sites. One of the books that I've looked at so far, The Non-Designer's Web Book is really cool. It has lots of pictures and clear explanations for lots of things in web design.